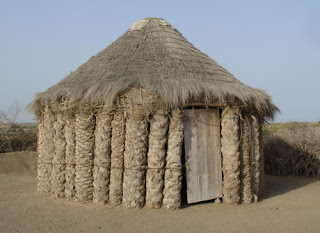 Have a look at "Martin's Ten Rules of Roof Design", over at Green Building Advisor.com, for some solid, practical advice on how creating durable, functional shelter. I especially like numbers 2, 4, 7, and 9, and the section titled "A preemptive comment directed at indignant designers". A roof is, after all, the most essential component of a house. Why risk compromising it? I'll add one point to those in the link above. The roof on this pictured building is superior to most of the roofs in your neighborhood in at least one way: nobody is under the impression that this roof is forever. Anyone can see that it will need regular maintenance. Unfortunately, too many people I know get a roof, they think it's a done deal, and they never think about it again. Until it fails, sometimes catastrophically, thanks to lack of maintenance. Last Saturday, Jackson and I participated in a workshop focused on water management that featured presentations by several area experts on urban planning, hydrology engineering, environmental science, and building science. Ramiro Diaz of Waggonner & Ball Architects described the work their firm is doing to imagine and plan for a wholly new way of handling and living with the enormous quantities of water that surround our city all the time and fall on us in storms both small and -- cross your fingers -- large. They are developing the concepts that resulted from the Dutch Dialogues, a partnership of "Dutch engineers, urban designers, landscape architects, city planners and soils/hydrology experts and, primarily, their Louisiana counterparts." The gist of Dutch Dialogues, and Mr. Diaz's subsequent work, is to find ways of increasing the city's capacity to detain water and remove water and reducing the long-term costs of drainage, all while using the drainage system as an asset to the community, rather than their current status as invisible or ugly. Louis Jackson of CDM described the work he is doing under contract with the City to assess and propose ways of increasing the capacity of the current drainage system. A major part of his project has involved mapping the city's existing drainage on a block-by-block level and modeling how it would perform in storm events of various intensities. The long and short of his conclusions thus far, paraphrased: bigger pipes, more pumps, lots of money. Jennifer Roberts of Bayouland RC&D presented the environmental impact of drainage water on the Pontchartrain Watershed as a whole (it's polluted, but progress is being made), highlighted major sources of pollution in drainage water (oily & littered streets, soil runoff from construction sites, pet- and human-related bacteria), and described how citizens can help improve our watershed in their own homes and neighborhoods (keep storm drains clear, and don't dump your trash/paint/crawfish boil down them; reduce or slow down runoff from your property). Steve Picou of the LSU Agcenter discussed some of the primary ways of reducing and slowing runoff, as well as a few other water management issues for homeowners: keep water away from your foundation and out of your house; reduce impervious surfaces like large, circular concrete driveways; include gravel in your landscaping; and plant rain gardens. A local organization called Groundwork NOLA specializes in helping people set up rain gardens, as part of their larger mission for "sustained regeneration, improvement, and management of the physical environment by developing community-based partnerships that empower people businesses and organization to promote environmental, economic and social well-being". This Old House magazine offers a variety of tips and plans for installing your own rain management system: link.